The cooling unit plugs into a standard wall outlet. The components of the cooling unit draw 3 amps, and the electric outlet on the side of the cooling unit also is rated for 3 amps. The cord extends 6 ½ feet from the back of the cabinet. If an extension cord is used, it should be 14-gauge wire or thicker, grounded, and as short as possible. We recommend using a surge protector rated at 15 amps or more, and using a dedicated 15-amp circuit if possible. 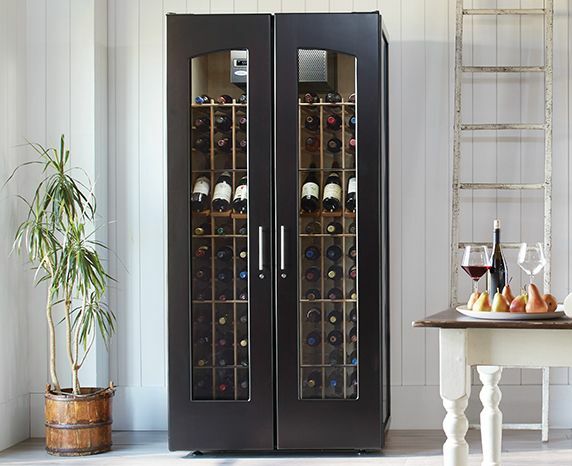 Under no circumstances should the wine cabinet share a circuit with another motor or compressor-based appliance, like a wine cooler, fridge or air conditioner. CellarPro cooling units are designed to handle temperatures ranging from 50 to 95°F. Contemporary wine cabinets, Loft wine cabinets and Vault wine cabinets require 18 inches of clearance above the wine cabinet. The sides always need to be open—in other words, placement in an enclosed space, alcove or closet will not work without our front-vent hood (see Configuration 3 below). European Country wine cabinets and Mission wine cabinets can use our front vent hood without the decorative grill (the grill will not fit with crown moldings). Credenza wine cabinets don't require any clearance above the wine cabinet; however, all credenzas require 3-4" of space behind the wine cabinet because all the ventilation (intake and exhaust) occurs behind the cabinet. If you received an air diverter with your credenza, use the magnets to place the diverter on the back of the cooling unit (at the back of the credenza) so that the hot air exhaust is directed to the left (when facing the credenza).